D&B’s operations in the U.K. have entered a new and exciting phase. 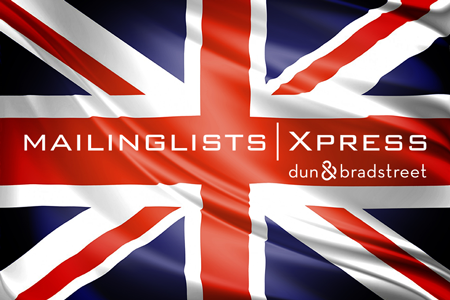 Beginning June 1, 2018, MailingListsXPRESS, a Dun & Bradstreet data partner since 1994, assumed responsibility for serving UK customers of D&B. We will continue to deliver on the promise our loyal and valued D&B customers throughout the UK care about most: the quality and service they expect from genuine D&B data. The relationship between MailingListsXPRESS and D&B has grown for 24 years. We manage hundreds of Dun & Bradstreet accounts worldwide. MailingListsXPRESS provides enhanced access to all D&B files. MailingListsXPRESS will honor all current contracts and pricing. Contract customers receive the same D&B data per exact agreement terms. UK Customers serviced locally by MLXP experts with extensive D&B experience. MailingListsXPRESS/Dun & Bradstreet Data is fully GDPR compliant. You are invited to reach out to Joanna Webster, our newest UK team member, or Steven Sheck our president and founder, and begin to understand how your new relationship with MailingListsXPRESS/D&B can be more rewarding than ever.